Enjoy watching wildlife from our sunny deck overlooking the Kenia River. Eagles soar overhead. Moose graze just feet away. 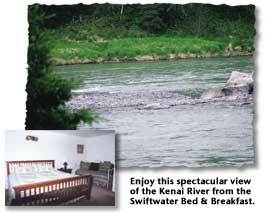 The great King Salmon roll and turn in the blue-green water of the greatest salmon river in the world. We have a variety of clean, comfortable rooms to suit your needs. Choices range from a large hot tub suite to an economy room just right for the fishermen. All guests have access to a sauna, dock and deck with a barbecue. Children under 12 sleep for free in parent's room. All rooms are non-smoking. We are located on the banks of the beautiful Kenia River and offer personal service. All rooms include either a brekfast or a sack brunch to take with you. Fisherman's Room with shared bath. Hot Tub Suite with private bath, hot tub, and balcony. King Room with sitting area and full service kitchen and private bath. Roll outs availabe at extra cost or $25 including meal. Children under 12 no additional charge in parents room. * 5% Sales tax not included.